I always wanted to be the kind of person who kept a writer’s notebook with me all of the time. I do love notebooks… It doesn’t work out for me though – I’ve tried. I leave it places, or it gets lost in the car mess, or squished in my backpack, and I can’t actually get it out and start writing when I have something to write, which is often. I’m trying to slow down my life a little so that I have time for a notebook. One day I’ll have more than a moment of time to write. But, I’m not there yet. This is not good. I lose so many thoughts and ideas. So, I try to grab my phone and add notes. Sometimes the notes are typed in, and sometimes they are voiced to text. The voice to text ones are always fun to read later. One day I’ll make sense of these notes. I have notes that are part of a picture book idea I have swirling around… And notes that are slices I have glimpsed but not caught yet. "Passing out musical instruments." "I am not a tinkerer." " I am not a painter, right?" "We should do this every 2 years." I wonder what that was about. There are other quotes as well, things my own kids have said that I just know I want to remember. "Who does more work? The president or the government?" who got to the White House won?" There’s also parenting advice – things I’m supposed to remember to ask my kids after they have a consequence. "What, why, how? How are you going to remember to do it? How will we know you do it?" I said that in 2012. I think I knew it even before then. But why did I write it then? vegans can go in. We can pray for the animals." H, 6 years old. "Ugh! Why am I always talking? I think I'm sick." - E, 3 years old. One day I’ll make sense of these notes…. But I wonder… Does this mean that I already have a Writer’s Notebook with me all the time? A Slice of the first day back. I don’t have one little word yet. I didn’t finish my grading today. I didn’t hear my 5:30 alarm… didn’t wake up until Mr. Thought shined a light right at me around 6:00. It was raining and grey all day. I don’t quite have a handle on the literary essay unit I am starting tomorrow. My muscles are sore from just 3 days of working out. There are so many kids with missing work even after multiple reminders. The laundry didn’t magically get done while I was at school today. After a brief moderate break over vacation, I don’t eat sugar again. My classroom was clean and fresh until 8:01 this morning. The students came back, and I didn’t have to cajole them to answer the “What I missed” section of my whiteboard question. They just did. We all love vacation, and I’m not saying I wouldn’t vote for another week or so at home with my own kids… ignoring my chores and reading books. But…how lucky I am to spend my day at school with kids who missed their friends, their school, not being bored, math, and … me! Plus! 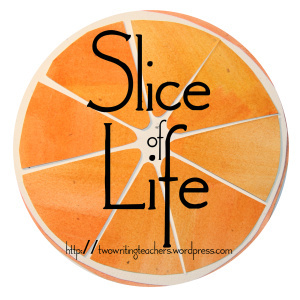 I counted 9 Winter Break Slice of Life challenges in my in box today, and 9 Book a Day challenges too! That’s a record for my winter break challenges. Yay for reading and writing during break! Don’t stare at me like that. I will try to empty you after the kids go to bed. Maybe. Nobody wants to go to bed. I don’t blame them. After one more sleep, winter vacation is over. H says, “That’s it! Then we will have to wait an entire year before another winter break!” And I remember how long years were when I was a kid. Now the days are sometimes long… but the years are so very short. I know that next thing we know, it will be next Christmas. It’s bedtime, but the kids are busy. They are reconstructing the MacGyver episode they just watched. MacGyver. Yep. I can’t tell if they like the time at home with their family, or just the amount of tv we’ve let them watch. I know I was busy playing games with the kids, writing on my computer, and reading books in the family room. I’m sorry I didn’t pay more attention to you during this vacation. Oh School Bag – you might remember that I did open you briefly at the beginning of vacation. This was before I shoved you in the corner of the dining room. Somehow, you are still full of things I should have done. A stack of papers to grade, some paperwork to fill out… I hope you have enjoyed your vacation. Tomorrow we go back to school! As usual, it feels like just as we are finally into the swing of a school break, just as I finally forgot that you were sitting half unzipped behind the buffet, break is over. Just as I have gotten relatively on top of the dishes situation…I had to pack lunches again. (You may have noticed that I slipped a bag of gluten free crackers in your small pocket a bit ago. I’ll take those out when we get to school) Just as I finished the last load of laundry… just kidding, I never finish laundry. There is no “last load” of laundry. Even you know that. I think there’s a cardigan somewhere in your bottom. Now you are here at the table with me, as I hide in the dining room, waiting for the MacGyver conversation to fade a bit. I finally took the Literary Essay Unit of Study book from your grasp, and when I give it back to you, it will have a few more post-it notes stuck inside. Hopefully I won’t fall asleep too long snuggling kids to bed tonight, but if I do – I’ll take the grading out of your grip first thing during our planning period tomorrow. I promise. 10 chocolates snuck, even though I’m trying not to eat candy. 9 slices written so far. 7 minute workouts . . . short but intense! 3 times a day the kids want to eat a meal! Shocking! 1 more day to actually open my school bag and get work done!